J.J. Abrams’ 2009 reboot of Star Trek was sort of a magical thing. The story was sloppy, filled with coincidences and contrivances, and had a weak central villain, but between some truly excellent performances from the cast, strong moment-to-moment direction from Abrams, and a general sense of fun it managed to sweep you up in the thrill of getting reintroduced to these characters all the while allowing you to stay blissfully ignorant to its inherent story problems. It’s one of those rare films that’s absolutely a mess on paper, but up on screen is actually something that is quite good. Star Trek Into Darkness, sadly, has an even worse story and none of the magic that made Star Trek ’09 work in spite of itself. I really hate to do this three times in a row, but here again I’m going to have to do a spoiler review to really dive in and explain why Star Trek Into Darkness is not only a bad Star Trek movie but just a bad movie in general. 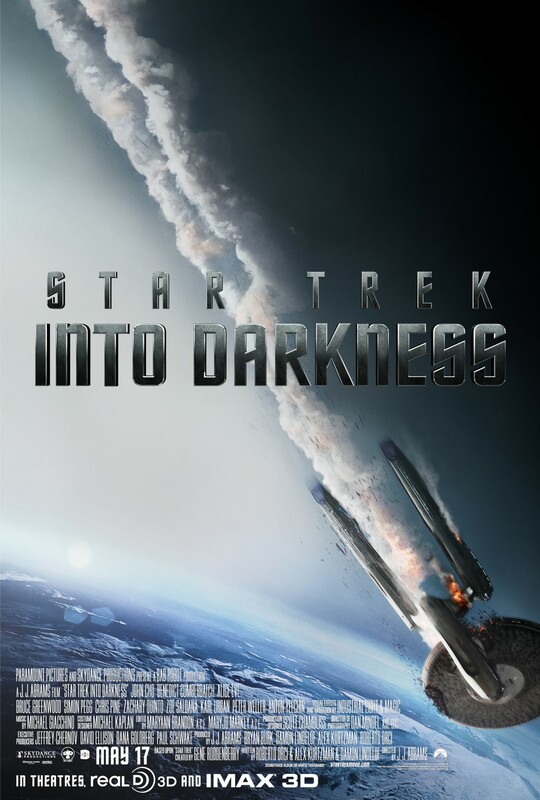 To be fair, this isn’t the worst Star Trek movie (it doesn’t reach the deplorable depths that most of The Next Generation films existed at, and I’d be more likely to revisit Into Darkness than The Final Frontier) and the first half of the movie serves as a serviceable, if lackluster, sequel to the 2009 film. There’s some frustratingly unnecessary subtext that ties into screenwriter Roberto Orci’s idiotic False Flag conspiracy nutbar philosophy, but it’s tempered by some well executed action set pieces and the joy that comes from the cast once again making these characters come alive in a way that defies expectations. However, the movie is a downward spiral and what starts as a sub-par sequel steadily goes off the rails into the territory of bafflingly bad. Before we move on with the rest of the review I’ll say that I don’t recommend this film, but if you’ve already made up your mind about seeing it go for IMAX 2D (I know with the pervasiveness of digital projection this isn’t possible in a lot of markets, including my own). The scenes shot on IMAX film make it worth seeing in that format, but the post-converted 3D doesn’t benefit the movie and in some cases is kind of bad. Now, with those basics out of the way, let’s move onto the full SPOILER-filled review. Let’s just cut right to the chase: Star Trek Into Darkness’ biggest problem is that the film is built on a monumentally stupid narrative. This movie is a train wreck in slow motion; at the start it doesn’t seem that bad and maybe the damage can be repaired, but as you keep watching the damage becomes more and more extensive before, finally, the whole thing comes off the rails. As I mentioned, the film starts off well enough. It takes a cue from Indiana Jones by opening with “the end of the adventure you’ll never get to see” and it sees the Enterprise crew attempting to stop an erupting volcano from wiping out a primitive humanoid race, all the while trying to hide their presence from them so as to not violate the prime directive. There’s some logical failings in this sequence, (such as: why did they feel the need to hide the Enterprise underwater instead of just maintaining orbit around the planet?) but overall the scene is fun and energetic and it works. The silliness of the scene’s logic allows for it to play out in a way that is engaging. It’s clunky, and there was probably a much more elegant way they could have accomplished the same goals, but like the first film it’s fun enough that you can forgive it. Unfortunately, the opening scene is the best the film has to offer. Almost immediately we head back to earth and see Kirk demoted as a consequence of violating the prime directive. This in and of itself isn’t bad, and Kirk trying to redeem himself could have been a strong through line for the film, but instead it’s a temporary inconvenience as minutes later his command of the Enterprise is reinstated following Captain Pike’s death. Pike’s death is frustrating for a number of reasons. One, as I said, it almost immediately reestablishes status quo after Kirk was demoted making the whole act of Kirk’s demotion a wholly pointless plot device. Two, it also rings hollow on an emotional level. Pike’s relationship with Kirk is something that appears almost entirely off screen, and as such we don’t have a lot of investment in it. We hear about Pike advocating for Kirk and we’re told how much Pike meant to him, but it’s never shown. In fact, the most poignant moment of Pike’s death – when Spock mind melds with him, seemingly to bring him a sense of calm – is ruined later in the film by a throwaway line of dialogue about Spock trying to experience the feeling of death. This turn of events illustrates a recurring problem with the film: it can’t decide what it wants to be about. Is it about Kirk trying to redeem himself in the eyes of Starfleet, or his motive more about vengeance? It sort of tries to be both and in turn fails at each one. The movie demotes Kirk so that he has to fight to redeem himself, but then his command is handed back to him when Pike is killed. The movie kills Pike to try to take Kirk to the edge and make vengeance a reason for his recklessness, but the movie has already established that Kirk was reckless before Pike’s death. It’s a whole lot of screen time spent trying to justify something that ends up being moot. And on top of that, the story is wrapped up in an overly complicated and ultimately nonsensical conspiracy plot. You see, Kirk is sent by Admiral Marcus to go after John Harrison, the rogue officer who killed Pike, but this guy happens to be hiding out on Kronos, the Klingon home world. Right now Starfleet and the Klingon empire are on the brink of war and a Federation flagship in Klingon space could incite galactic war. So instead of just going in and beaming this guy off the planet, the Admiral gives Kirk an arsenal of 72 mysterious super missiles (which end up housing genetically enhanced super soldiers) and instructs him to fire them from the edge of neutral space aimed at Harrison’s hideout. Just about every member of the Enterprise expresses to Kirk how moronic this plan is, but Kirk goes along with it anyway (as an aside, I’ve heard it said that if characters in your screenplay are complaining about how stupid your story is you probably have a problem). As it turns out (surprise!) Admiral Marcus is conspiring to get the Enterprise crew blown up in order to justify a war with the Klingon empire. Let me point out again that Roberto Orci, one of the screenwriters of the film, is a proud, card-carrying idiot member of False Flag and Truther conspiracy groups. If you’re fortunate enough to not already know what that means, he essentially buys into the idea that the United States government is in the habit of regularly killing its own people in order to justify war with other countries. This type of conspiracy mongering, aside from being completely moronic, is totally at odds with everything Star Trek is supposed to represent. When Gene Roddenberry created Star Trek it was intended to represent an optimistic vision of the future, a future in which mankind has put aside petty differences of race, gender, etc., and united as a species with other races of the galaxy to advance the betterment of all peoples. The cynical backstabbing nature of False Flag conspiracy has no place in a Star Trek story, and is by its nature offensive on a number of levels. The film actually ends with a dedication to the men and women who lost their lives during the 9/11 attacks. I suspect most people will find it somewhat odd and out of left field, but ultimately dismiss it as a nice sentiment. However, knowing who Orci is and what his idiotic beliefs are I was disgusted by this. I want to emphasize, though, that as much as I’m bothered that the tone of this narrative is unquestionably wrong for Star Trek, it would still be bad even if this wasn’t a Star Trek film. Like most conspiracy theories it’s overly complicated, poorly thought out, and ultimately strains credibility well beyond the breaking point. It’s moronic, hard to follow, and not entertaining, which is all on top of being fundamentally wrong for a Star Trek story. While we’re on the subject, I should probably explain a bit of my history with the series so you know where I’m coming from. I would classify myself somewhere between a casual and intermediate Star Trek fan. I grew up mainly watching The Next Generation, but as I got older I got into the film series and eventually some of The Original Series. I don’t have much experience with Deep Space Nine, Voyager, or Enterprise, but between my experience with the films, TNG, and TOS I feel I have a pretty solid grasp on the core concepts and themes of Star Trek. While there were definitely some nitpicky issues I had with the 2009 film outside of basic story problems, overall Abrams and company managed to successfully find the essence of the characters and the themes of Star Trek while updating them to a 21st century aesthetic. Star Trek Into Darkness manages, for the most part, to keep the core cast of characters intact, but completely and utterly fails when it comes to introducing new characters and concepts from the Star Trek universe. With that in mind, let’s address the worst kept secret of the J.J. Abrams mystery box: Khan. I’m still trying to decide what they were trying to accomplish by including Khan in this film. You see, the character of Khan in Star Trek Into Darkness is, for all intents and purposes, a completely different character than the Khan that existed in the original continuity of the show* and could have just as easily been an entirely new character. It would make sense if name recognition was the draw, yet they intentionally (and unsuccessfully) did everything they could to try to conceal the character’s name from the public before the film released. In fact, I can say with confidence that tying an otherwise unrelated story to Star Trek II: The Wrath of Khan is ultimately responsible for most of the worst things about this movie. Benedict Cumberbatch is fine as Khan, but he’s really not given much to work with. The character is stripped of all of his defining characteristics from when he was portrayed by Ricardo Montalbán, and is merely one of 73 genetically enhanced super soldiers who does whatever the story requires him to do at that particular moment. At the beginning of the movie he’s a maniacal terrorist, then he’s a tragic anti-hero, then he’s a Hannibal Lecter-style dangerous alliance, then he’s a monologuing super villain. Don’t mistake this for character development, because none of this has a through line, it just changes from scene to scene to reflect the needs of the story in that moment. I will say, though, that Khan is still infinitely better than the other character imported from Wrath of Khan: Dr. Carol Marcus. There is literally no point for this character to be in the film. Every single thing she does could have been done by any one of the nameless crew members on the Enterprise, and her entire function in the movie essentially amounts to a single gratuitous shot of Alice Eve in her underwear. Again, I don’t understand the point of any of this. These characters have no relation to the characters that existed in Wrath of Khan and their presence in the film was intentionally obfuscated so the name dropping of fan favorites couldn’t even be used for promoting the film. It’s fan service that has no meaning to fans. By naming a character after a fan favorite and then jettisoning everything that made the character special all you accomplish is alienating fans. ** You also misguidedly invite comparison to what’s universally accepted as the best Star Trek film, a comparison Into Darkness could never have hoped to live up to. However, that’s not nearly the worst of it. Oh no, they do something so horrendously stupid that the sheer thought of it boggles the mind. They remake the death scene from Wrath of Khan. We’re talking arguably the most iconic moment in the whole history of the series, and they decide to do it again! Sure, they reversed it so that Kirk was the one getting radiation poisoning trying to save the ship and Spock was the one on the outside, but the whole scene is just amazingly misguided for a whole range of reasons. For one, the scene could never hope to have the same weight as the scene from Wrath of Khan. The new versions of Kirk and Spock have only been with us for two films while by the time Wrath of Khan rolled around Kirk and Spock had a history that spanned 79 television episodes and two feature length motion pictures. In Wrath of Khan it carried the emotion of two old friends saying goodbye, that’s something Into Darkness could never hope to recapture. Also, there’s the issue that we’ve already seen this before. The whole thing is so deeply rooted in self-reference to the point of near-parody that it rings completely hollow. In Wrath of Khan it was a scene that evolved naturally out of the themes and narrative of the film, but here it only exists because it was in Wrath of Khan. It’s not an emotional climax of the story, it’s a high budget fan remake made by people who aren’t really fans to begin with. *** Finally, and perhaps most importantly, anyone in the audience who has been paying attention remembers the fact that the movie has established on numerous occasions that the magical genetically enhanced blood of Khan and his crew can bring back people (and tribbles) from death or near-death. I’ve spoken before about how the ending of a film should ideally be both inevitable and unexpected, that it should evolve naturally out of the story yet still manage to catch audiences by surprise. This ending does neither. The remade death scene is shoehorned into the film and does not evolve naturally from the rest of the film and the resolution to this contrived problem is so plainly telegraphed at numerous points earlier in the film that it’s near impossible that it could catch you by surprise. And yet, there’s more problems still. After Kirk’s death, Spock engages in a terribly anticlimactic foot chase with Khan in order to bring him back to the Enterprise to use his blood to revive Kirk. Here’s the thing, though, they already have the other 72 members of the Botany Bay lying in cryo tubes on the Enterprise. For Pete’s sake, they even thaw one of them out so they can put Kirk in cryo sleep to prevent brain deterioration. Other than the act of catching the bad guy there was no urgency in catching Khan, they could have just pumped out the blood of any of the other popsicles and given it to Kirk. I’ve said numerous times that there’s an inherent difference between real world logic and movie logic, and that there are some cheats allowable in order to make the magic trick work, but this is just lazy storytelling. Here the magic trick doesn’t work and there’s a big fat wire, perfectly visible to the audience holding up the climax. The creative team simply couldn’t be bothered to address it. On a semi-related note, I’m somewhat concerned about the fact that this new Star Trek universe has effectively cured death. In terms of creating and maintaining dramatic stakes in future films, this development could potentially break the series. Star Trek Into Darkness isn’t all bad, just mostly bad. The cast, overall, remains excellent with Simon Pegg, Karl Urban, and Zachary Quinto in particular bringing a lot of life to their characters. I do wish, though, that we got to see more of Bones as his role as the intermediary between Kirk and Spock is still being predominantly filled by Zoe Saldana’s Uhura, but at the very least that gives that character something more to do than repeat what the computer says. There’s a handful of well staged action sequences as well, but in many cases they fail to carry the weight they should because they don’t grow naturally out of the narrative. I’m more than happy to see this cast return for a third film, but I’m ready for a new creative team, specifically one that has a strong respect for Star Trek’s themes and ideals. Or, you know, at the very least one that can make a movie that has a decently constructed narrative. *Which really doesn’t make any sense because Khan’s backstory happened prior to Nero’s time travel shenanigans in the previous film and therefore should be exactly the same in both timelines. **Before you go there, this is completely different from the Mandarin in Iron Man Three. There a fan favorite character was changed to subvert expectations and support the overall theme of the story, whereas here classic characters are replaced by empty shells that are neither surprising nor do they benefit the story by their inclusion. Swap out the names of Khan and Dr. Marcus and the movie doesn’t change in any significant way; swap out the Mandarin and you completely change the identity of Iron Man Three as a film. ***This is not an insult, merely a factual statement. J.J. Abrams has always been forthcoming about the fact that he’s never been a Star Trek fan.